In a business environment where value for money is the focus, over 70% of CEOs have stated that responsible business practices have a positive impact on their bottom line. These are the findings of the CEO Responsible Ireland Survey 2012 run by Business in the Community Ireland. The research performed by Amárach also found that one in two CEOs believe that corporate responsibility (CR) policies and practices have given them a direct competitive advantage ranging from tender acquisition and staff retention to general improved reputation. The survey results are being announced at the launch of Responsible Business Week 15th-19th October 2012. CEOs believe that Ireland’s overall business reputation is on the rise improving more significantly abroad (70%) than at home (58%). 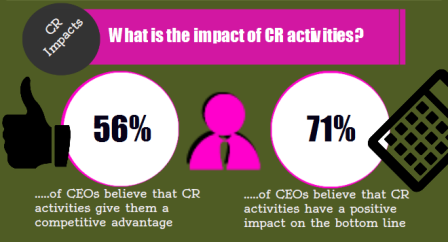 The internal reputation of companies is also coming more and more into the spotlight as more than half (56%) of all CR activities are now focused on the workplace with companies providing staff with well-being programmes, professional development and volunteering opportunities. Community remains the highest focus with 69% of companies involved in community programmes. Just under half of companies are running environmental protection programmes. Although CEOs are seeing a return on investment, just over one in every five companies (22%) have no measurement system in place for their CR and sustainability practices. A further 20% are only using ad hoc, word of mouth measurement meaning that nearly half of all companies have no specific measurement system for sustainability practices in place. “Measurement of corporate responsibility allows for management of policies and practices and can help to identify gaps or risks in a company’s business chain. Until companies start to measure CR practices it will be difficult for them to develop a comprehensive business strategy that has sustainability at its core.” said Roche. However, engagement levels are growing within companies with nearly 60% of companies saying all departments are now equally engaged with the CR agenda. Finance departments were highlighted as the least engaged followed by IT. Interestingly, nine out of ten CEOs said that they have a personal dedication to having a responsible business agenda, showing that CEOs are leading from the front when it comes to running a sustainable business. Click here to download the full report and here for a copy of the presentation.